Its snowed yesterday at Atlanta. It was our first time, having Samuel with us, experiencing snow. We were excited to see him play in it and have fun with his siblings, all the kids were excited. We decided that after nap time would be a good time to let them all go out and play, so as the kids got up and Samuel was the last to wake up we all waited on him to see how he would react to the snow. Things did not go as we imagined. The snow upset him, a lot. He communicated to us that he remembers being cold when it snowed in China, and he was very upset that China ge ge (his foster brother in China) was probably cold right now because of the snow. Of course we don’t know the circumstances of his foster family in China, and we do assume the best and love them, but we now know that our son remembers being cold in more than a “man its cold, let me go sit by the fire” sort of way. That was hard. Its also hard to hear him worry for China ge ge (his foster brother). Samuel prays for him every day and talks about him daily as well. We all pray for him daily, that God will give him a forever family. A few days ago Samuel told us he was going back to China with mommy and daddy so that he could get China ge ge and bring him home. To be honest there is a large part of me that wishes that were true, not because we “need” more kids, but because that child is Samuel’s brother in a very real and meaningful way. And because that child has very little likelihood of being adopted and I hate to think of what will happen to him when he ages out at twelve years old and has to fend for himself. Its hard to see my son miss his brother so much and not be able to do anything about it. So we pray. All of this has been a good, but hard reminder. Samuel had a life before us that has shaped and molded him. He had times of happiness and times where he knew need. He has a brother half a world away that he misses greatly and longs to bring into a happy family with him. His story didn’t start when he became a part of our family, it started long before, and that’s ok. 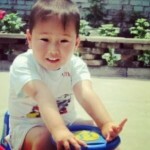 If you want to pray for Samuel’s foster brother with us, here is his photo and a little information about him. Please pray that God will give him a family soon. Postoperative Meningocele, Postoperative hydrocephalus, Tethered Cord Syndrome, Repaired Bilateral Club Foot. Anthony is living in a loving foster family who he is very close to. He is described as a gentle and beautiful boy. His report states he is energetic and fond of playing games with other children. At the time of the report (April 2011) he was able to crawl and when wearing corrective shoes he could walk while holding on to something. We have requested an update from our agency since this information is from 2011. If you are interested in pursuing him for adoption, or in helping to advocate for his adoption please contact us and we would love to help.